In investigating the trafficking of fetal body parts in the United States, the House Select Investigative Panel on Infant Lives found a “symbiotic” and very possibly illegal relationship between the University of New Mexico and the infamous late-term abortion facility in the state, Southwestern Women’s Options. Rep. Marsha Blackburn sent a letter to Hector Balderas, Jr., Attorney General of New Mexico, recommending that the state launch an investigation into these practices. Blackburn indicated that the Select Panel uncovered violations of New Mexico’s Jonathan Spradling Revised Uniform Anatomical Gift Act, which for years has been misconstrued by UNM to allow for the donation of aborted baby remains. However, Select Panel attorneys found that the act specifically prohibits fetal remains from being donated for research or other uses, making the transfer of aborted baby remains from SWWO to UNM illegal. The Panel also notes that SWWO staff were brought on the UNM as “volunteer” faculty and received employee benefits at UNM…. Operation Rescue makes clear that it is longtime pro-life activists in New Mexico who originally made this discovery. 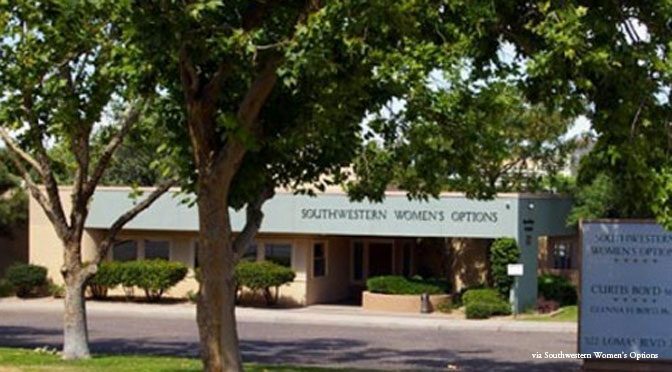 Bud and Tara Shaver of ProtestABQ have “for years called attention to Southwestern Women’s Options’ long affiliation with the University of New Mexico,” OR explains. Tara Shaver actually filed a complaint with the AG some time ago — which has been ignored — after discovering that Southwestern Women’s Options was supplying aborted fetal body parts to the University of New Mexico through “an abortion consent form that buried brief tissue consent language near the bottom of a wordy form that required a patient signature before abortions could be performed.” OR notes that the facility’s consent form has since been altered. Troy Newman, president of Operation Rescue, is hopeful that the Select Panel’s exhaustive document will at last get the attention of AG Banderas, leading to a criminal investigation and an immediate closure of Southwestern Women’s Options.